Looking for something exquisite that will capture the heart and imagination of someone you love? 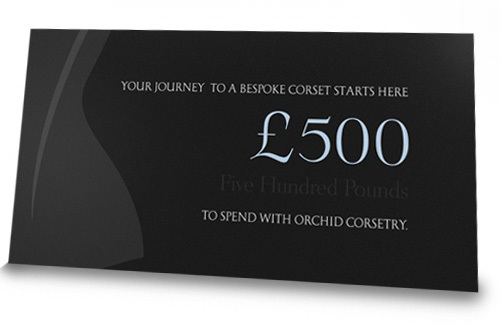 Look no further than Orchid Gift Vouchers. A unique code will be emailed to you after purchase to open up a world of luxurious lingerie and corsetry, from our online store to bespoke creations. Our vouchers allow you to give the gift of luxury and indulgence without the worry of interpreting someone else’s sizes and tastes. They can be used for anything in our online store, including sale items and can be used against a bespoke purchase if desired. We offer our gift vouchers in increments of £10, £50, and £100. Simply add the quantity of each for the amount you wish to give. Within 1 working day of purchase you will receive an email with your unique code for your loved one to begin planning their treasures. We also have physical vouchers for increments of £100 if you wish, and these are shipped free within the UK, just leave us a note at checkout to make arrangements. The lucky recipient will be given personal care and attention in making their choices. We are on hand to advise on what styles may suit them best, what size to choose or how to accessorise and complete a lingerie look on their allowance. We are well known for our friendly, helpful customer service and will make sure that the process is special and memorable! Now the gift problem is solved, please take a few moments to read the gift voucher terms and conditions, or if you’d like to know more take a look at the gift voucher FAQs – or of course, drop us a line.